We visited Cades Cove during the first of this month & witnessed some folks having a funeral at this church. We've walked through most of the cemeteries in the Cove & seeing the hearse in front of the church got me to thinking about the old days. I thought about the lives that were changed after hearing the sermons there. I thought about the couples who started their journey by being married there. I also thought about all of the families who have had to say goodbye or as I like to say, "see you on the other side" there. The stories those walls could tell! All of this thinking got me to wondering about the history of the church. 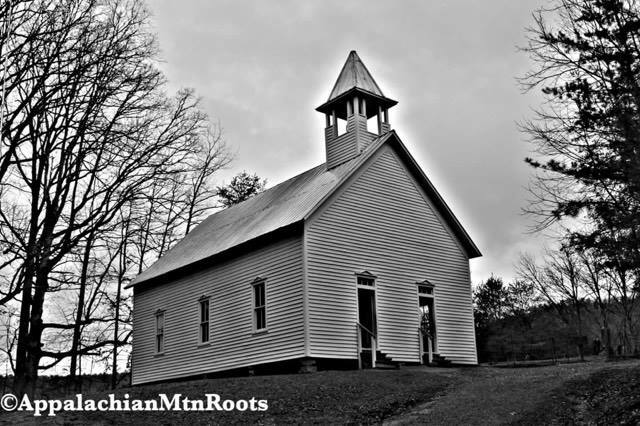 "One of the more treasured Cades Cove images is that of the Methodist Church as captured from the Rich Mountain Road. Cove churches were forces for integration of the community's religious, social, and communications needs. The penetration of the Methodists into the Cove may have preceded that of the Baptists as Methodist circuit riders ministered to many isolated mountain communities in the early 19th century, Dr. Abraham Jobe's childhood memories included Rev. George Eakin preaching as early as 1823. If you'd like to know more about the life of the early circuit riders, you can read an earlier post of mine here. I have always loved to learn about the history of places that I visit and I hope that you've enjoyed learning a little more about on of my favorite places. My husband proposed to me at the Elijah Oliver Cabin so I may have to dig up the history behind it to share with you in the future. Have you ever gotten to visit Cades Cove? What is your favorite part about it?